But the last 48 hours have certainly been blog-worthy. I shattered my previous record in cod fishing: my new catch tipped the scale at 16 kg, 35 lbs. On top of that the whole family went for a long hike to a beautiful beach. And we were invited and taken to another island nearby and came back to Rødøy in what felt like a snow storm. 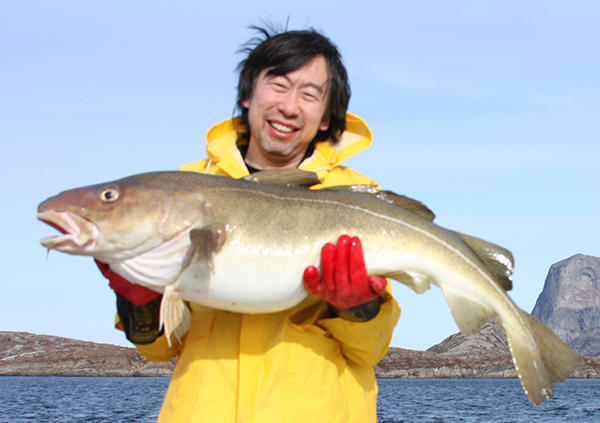 A 16-kg cod is a big fish even by island standards. I used heavy-gauge hand-jigging lines (jukse in Norwegian), stripped of most of the hooks so it only had a weight at the end and two hooks above it. The reason is, to catch the big cod, the hooks need to reach the bottom. But often it’s impossible to reach the bottom if too many small pollock (relatively speaking…) are caught on its way down. Plentifulness has its downside. I knew I had something biggish, but it’s always hard to tell with big cod. As cod rises to the surface, it’s hard to feel the weight of the fish because its swim bladder expands, making the fish rise without having to pull very much. When the hooks came to the surface, the fish was gone! The weight was gone! The line had snapped. In the midst of heavy disappointment, the cod was suddenly spotted floating in the water next to our boat! When you pull up something like that out of the oceans, it’s important to respect it. 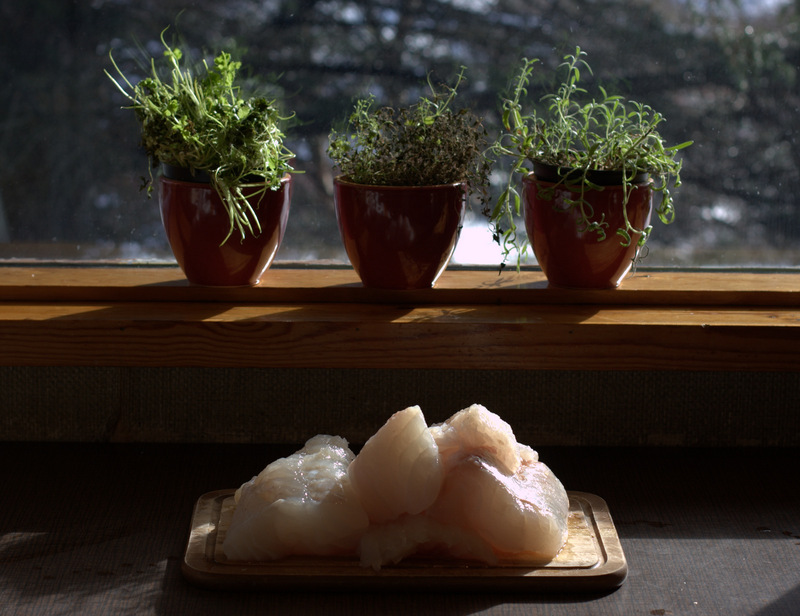 In the evening, it took me 5 hours to cut up two big cod and bunch of other smaller fish. It felt like butchering a pig rather than filleting fish. 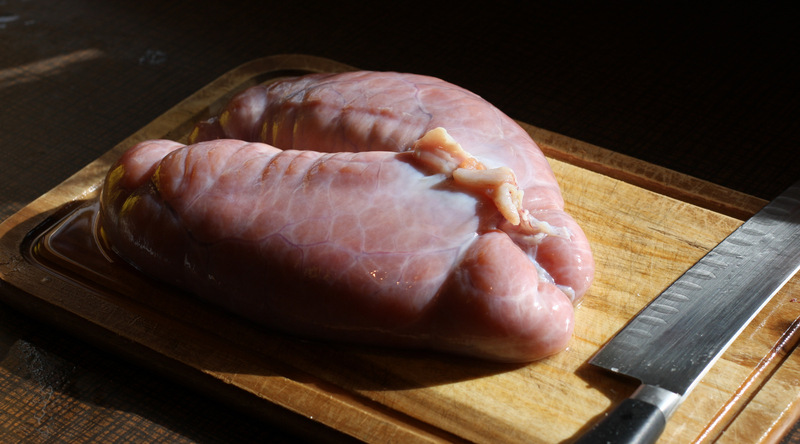 For the big cod, besides the filets, I cut up and saved the skin, the liver, the eggs, and tongue, the cheeks, and the air bladder. The rest I boiled to make a fish stock. We poached the liver (which is probably one of the most nutritious things in the world), and ate with bread, and saved two large jars of this stuff. The eggs I’ll make a caviar spread. The tongues and cheeks from the two big cod are enough for a meal for two: they’re great lightly sautéed in garlic and olive oil. And skin I’ll make into crispy chips which Nora loves. The air bladder? I haven’t figured out how to prepare it yet, but I do know people eat it. I love the texture of big cod. It’s very stringy, almost like crab. We made a classic beer-battered fish and chips from the filet today with aioli, a pungent Spanish mayonnaise. Seriously, it’s divine. The last time we made it, our guests limped off the dinner table in pain. And tonight it was no different. Life is good! The Cod Father is proud. The cheeks are the Best! part of big cod. A little flour, salt and pepper in a zip lock..,shake ’em and sauté them!! I really like the cheeks. They’re almost like scallops. There is something very Zen about cod. Also I think one has to be a little reverent of something that has lived so long and traveled so far in the sea. Thanks. Tremendouse fish! Winston! I have no words only feeling that you are happy! Happy I definitely was! I’m still living off the juice from that catch. Oh my Cod! What a great fish, pictures and wonderful story. 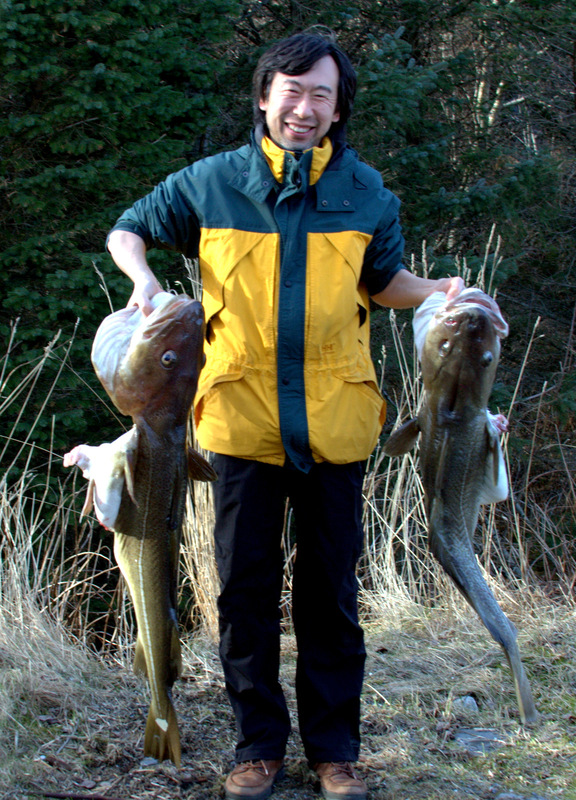 The contrasting looks on your face and the cod’s are priceless. Re: Blogging Frequency, I merely assumed you had discovered Angry Birds Space. Better than the original IMHO. I will try it out… Actually, I re-discovered the joy of programming.